Health is not simply the absence of physical ailments. To be healthy means to be in a state of wellness, and it is not limited to physical well-being. Like physical wellness, financial health is a state in which everyone strives to be. The similarities run deep. Financial well-being is the result of a variety of factors, one of which is the sum of each person’s lifestyle decisions. Good financial health is often the result of years of work and patience. Poor financial health can’t be fixed overnight: It requires long-term commitment. The importance of personal financial wellness has led Westerra Credit Union to make financial outreach and education a cornerstone of its day-to-day operations throughout the Denver community. 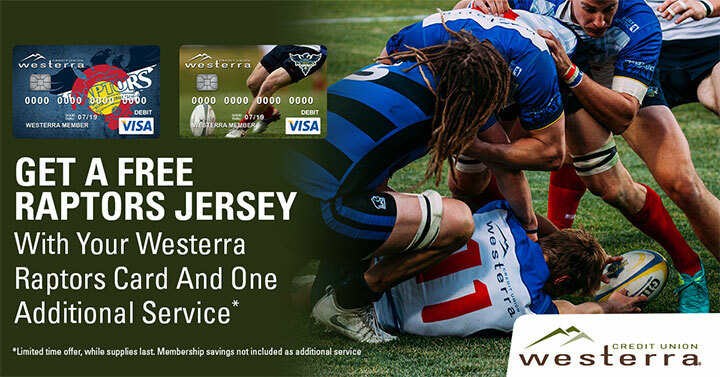 So, Westerra Credit Union’s partnership with the Glendale Raptors Rugby Academy was a natural pairing. Dana Russell, manager for PR and Marketing at Westerra Credit Union, said that the sponsorship met their mission of being an education and community based credit union: “Infinity Park and the Raptors are a huge piece of the community. It’s really something that kids can look forward to and be part of. It’s a way we can invest back in the community.” She said that in addition to the programs run out of Infinity Park, the Rugby in the Schools program, which sends out Raptors coaches to teach rugby basics at physical education classes throughout the Denver area, emphasize the commitment to bringing the benefits of rugby to everyone. Westerra also goes into area classrooms in order to bring essential financial information to students. The basics of personal finance are not difficult concepts to understand, and the concepts do not change much over time: Once you know them, you know it for life. Nevertheless, a recent Gallup poll showed that only a third of Americans use a budget to track monthly income and expenses, and about the same number have a long-term financial plan. To raise the level of financial literacy and action, Westerra makes it a point to teach these skills to students before they earn their first paycheck. When Russell, goes into a classroom, she makes the power of compound interest clear with a simple story: Person A invests $2,000 each year, beginning at age 22, and then stops contributing completely at age 30. Assuming an annual return of 9 percent, he or she will have roughly $580,000 at age 65. If Person B waits until they are 30 to begin investing, it will take 35 years of $2,000 annual contributions to reach only $470,000. Russell then goes on to demonstrate how most high school students really can start saving and investing for their future. First, it means taking stock of what you’re able to earn, and what goals you have. By laying out future expenses ahead of time, you’re able to build a budget. Russell said that a budget is a reflection of what you value and the decisions you make. Sometimes it involves a tradeoff: a nice car in exchange for a smaller apartment, or an apartment downtown and the decision to bike and use public transit. Westerra has online resources for students and parents to use to begin budgeting, tracking bank accounts, using a debit card responsibly, and more. Back in the classroom, Russell explains how a credit score is similar to a report card: It’s a statement about your prior work. You can improve a poor score through diligence, and you can lose a good score by being careless. It’s a simple but long-term job to maintain a good credit score, and Russell’s classroom presentations are just an introduction. Parents play a crucial role in a child’s ongoing financial education. Russell said that parents are often hesitant to share details about family finances, particularly stumbles they might have had. It seems too personal, or like it demands a veil of privacy. But these are ideal times to share. If you’re going on a vacation, explain the various costs and how planning ahead makes splurges like a vacation possible. Parents should consider involving their children in the decision-making process of various trade-off scenarios (i.e. should we go out to dinner as a family and play games at home, or should we eat dinner at home and then go out to the movies?). Russell said a fun exercise for parents is asking kids how much they think things cost and then revealing the true cost. Having these conversations can lay the foundation for decisions down the road, such as paying for a college education. Russell added that building a healthy mindset toward money is less about how much money a person has, and more about an understanding of what a person is responsible for and how choices they make affect their lives. Those are skills whose benefits extend far beyond money management. Raising healthy kids takes a village. Westerra and the Raptors are making sure that the village is ready for that challenge by offering programs that encourage healthy lifestyles.